This BBQ Chicken Dip has been sponsored by Albertsons Companies family of stores. All thoughts and opinions are my own. 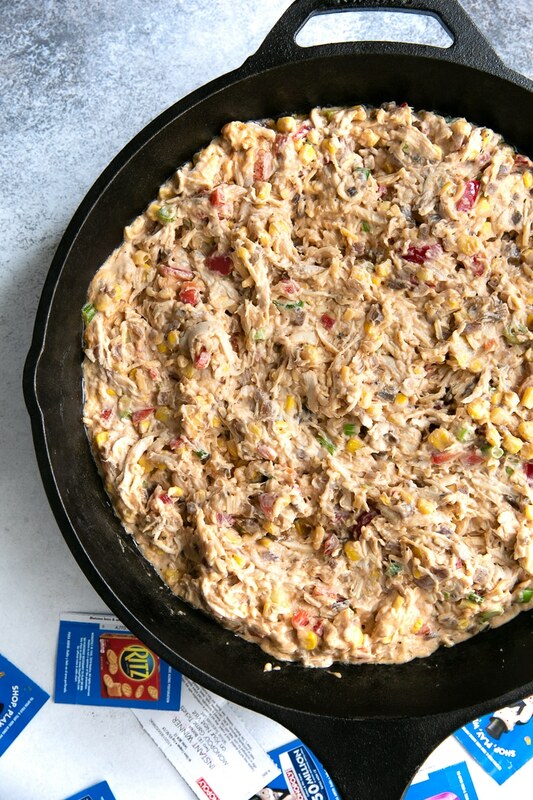 Sweet, tangy, and filled with gooey melted cheese, this BBQ Chicken Dip Recipe is fun and irresistible dip for any occasion! Filled with juicy shredded chicken, sweet BBQ sauce, creamy ranch dressing, caramelized onions, and melted cheese, everyone will come begging for the recipe! Most importantly, who here has been playing SHOP, PLAY, WIN!® Collect & Win Game featuring MONOPOLY? I am a BIG fan of games and free stuff, so this is always one of my favorite times of year to go grocery shopping at my local Safeway. And with $250 million dollars worth of prizes and money-saving offers this year (YES! Things like a $1 million dollar cash prize! 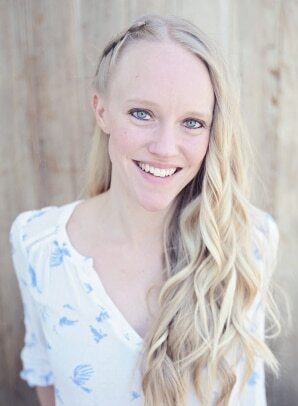 Or a fancy new vacation home, car, kitchen makeover, or loads of other prizes…), maybe we can win something awesome! Besides, the MONOPOLY Collect & Win Game makes grocery shopping at Safeway even more FUN as it allows me to do the shopping and keeps Octavian busy as he looks for qualifying products on our shopping list. If you’re new to The MONOPOLY Collect & Win game, don’t worry! There’s still time. 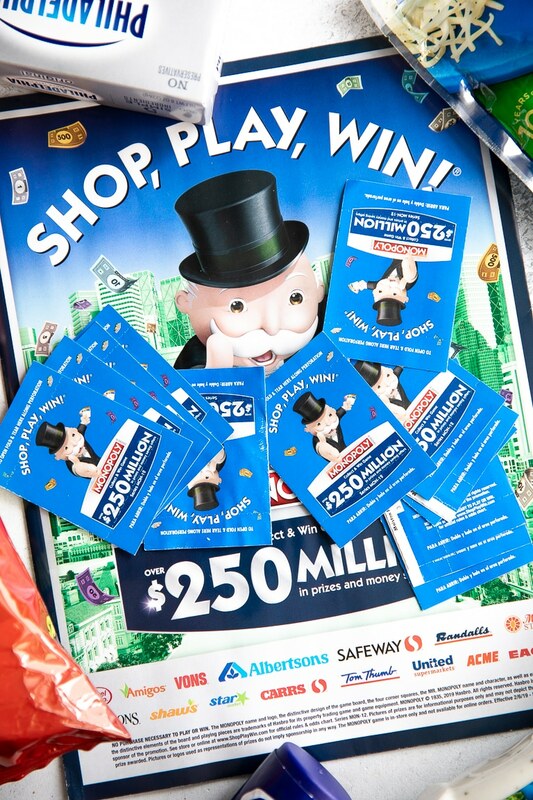 Go to your local store to pick up a MONOPOLY Collect & Win game board. Every time you shop, you will receive a game ticket PLUS additional bonus tickets whenever you purchase specialty tagged products (such as Prego Pasta Sauce Traditional or Kraft Shredded Cheese). Inside each game ticket, you will find 4 game markers and either an in-store coupon, online game code, instant win prize or 2 free game tickets prizes. For all you tech-savvy shoppers, you can also enter for a chance to win online (but really, it’s so easy!). Anyone can visit ShopPlayWin.com to participate. Head over to www.shopplaywin.com and enter the 16-digit alpha-numeric code found on certain game tickets or download the Shop, Play, Win App to scan your online game codes! To bring home a few extra game tickets AND feed my family (plus some friends), I thought it would be fun to make a recipe with a few go-to products for the MONOPOLY Collect & Win Game. 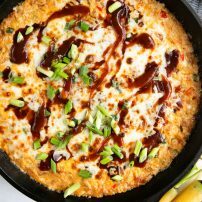 If you love BBQ chicken pizza then I can pretty much promise you that you will go completely BONKERS for this BBQ Chicken Dip. Creamier, cheesier, and just about the best thing I have ever baked in this cast iron skillet of mine. 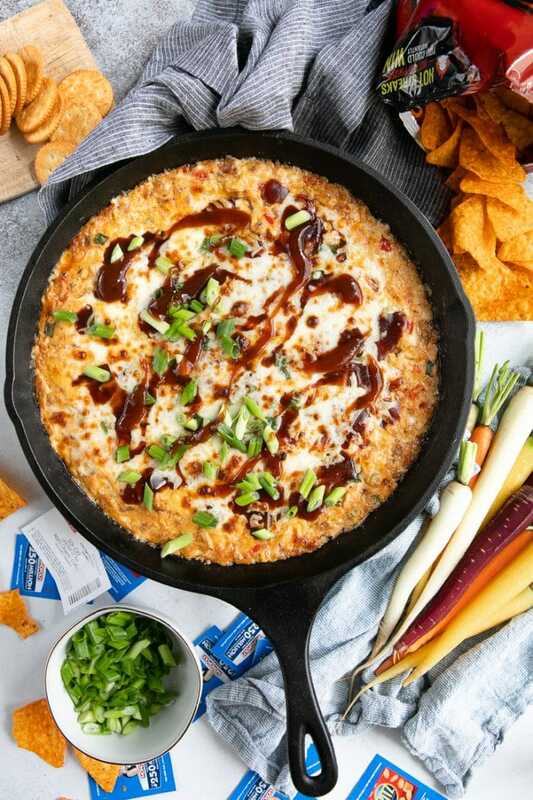 Filled with shredded chicken, BBQ sauce, ranch dressing, sweet corn, SO MUCH CHEESE, and irresistible caramelized onion, it’s easy to see why this is the best dip ever. Ok, so, what exactly is in this BBQ Chicken Dip? And how do you make it? 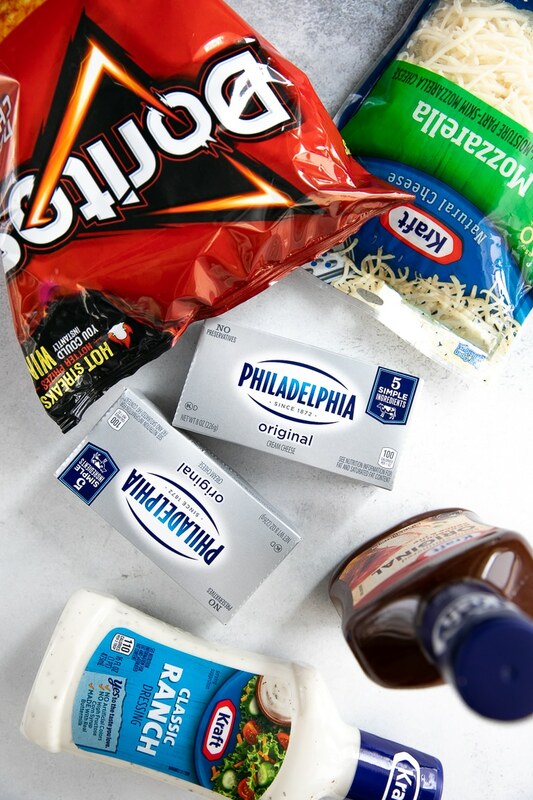 Most of these ingredients – like the chicken, BBQ sauce, and cheese – should seem pretty obvious. But, I like to be thorough; so I’m going to explain each of them to you. Chicken. I Poached my chicken in boiling water and simply shredded it afterward. Simple, and easy enough to do ahead of time. Feel free to use rotisserie chicken if you prefer, or your favorite baked chicken chopped into small bite-size pieces. If you’re worried that the chicken will be too dry, don’t worry about that. There’s plenty of other goodies going into the dip to compensate. Caramelized onions. 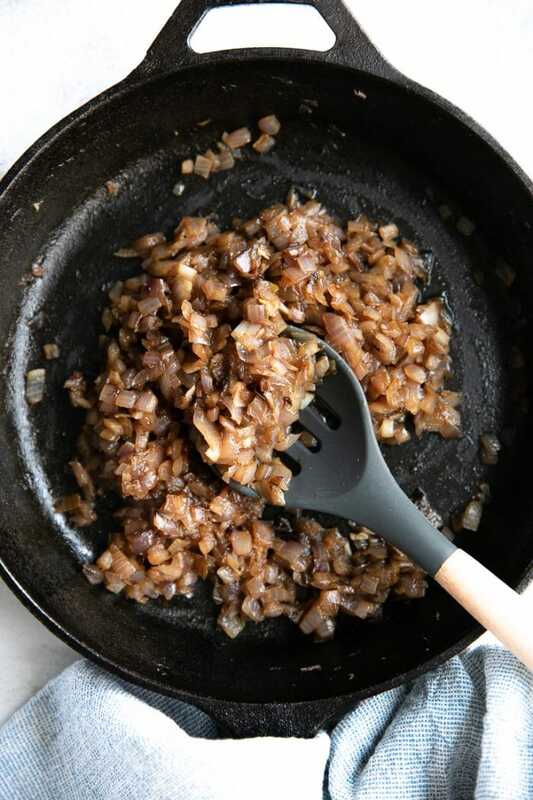 I should note that you don’t have to caramelize your onions. However, you should. It will take a little extra time and energy, BUT, it’s so worth it! Cream cheese. I don’t recommend low-fat or fat-free cream cheese, you guys. Go for the full-fat stuff. And, please allow your cream cheese to come to room temperature! It is literally impossible to combine cream cheese when it’s cold. Ranch dressing. Use your fav! BBQ Sauce. Same as above, use your fav! I love a BBQ sauce that is a little less smokey and a little sweeter. Bell pepper. I had a red bell pepper leftover in the refrigerator so I tossed it in. 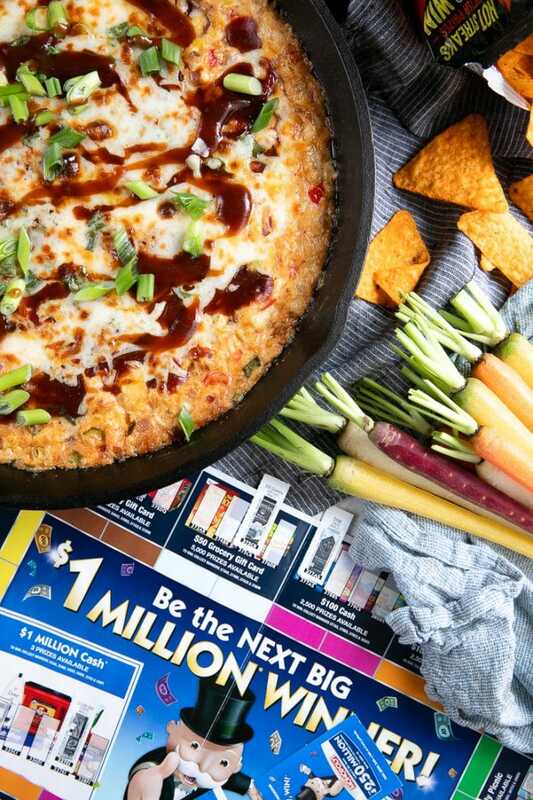 If I can sneak in any extra veggies into a skillet full of cheese and get my kid to get it then I am all for it. Green onions. Basically mandatory…or not. But given all the creamy, cheesy, gooeyness, sharp green onions help balance things out. Cheeses. Use your fav! Cheddar and Mozzarella are my go-to for dips like this but feel free to go wild and have fun! Corn. Ahh, sweet corn. Guys, I love sweet corn. The contrast with the cheese and BBQ sauce is super yummy. 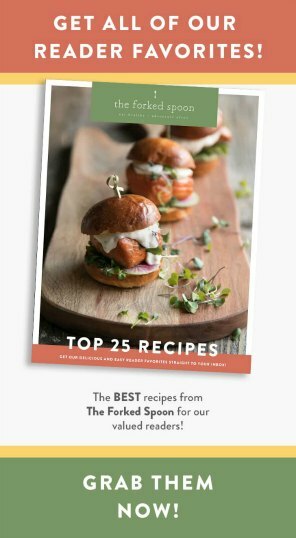 Poach your chicken. Bring a medium pot of water to a boil over high heat. Once boiling, add the chicken breasts so that they are fully submerged in the water (by at least 1-inch). Return to a boil, cover, and remove from heat. 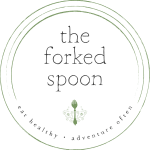 Allow chicken to cook for approximately 20-30 minutes, or until internal temperature registers 165 degrees F. Carefully remove the chicken from the pot and, once cool enough to handle, shred using two forks. Caramelize the onions. As the chicken cooks, prepare the onions. Heat 1 tablespoon of oil in a medium-to-large skillet over medium-high heat. Add the chopped onion and cook, stirring occasionally, for 10-15 minutes. Sprinkle the brown sugar over the onions and continue to cook until brown and caramelized. Remove from heat and set aside. Mix all the ingredients together. 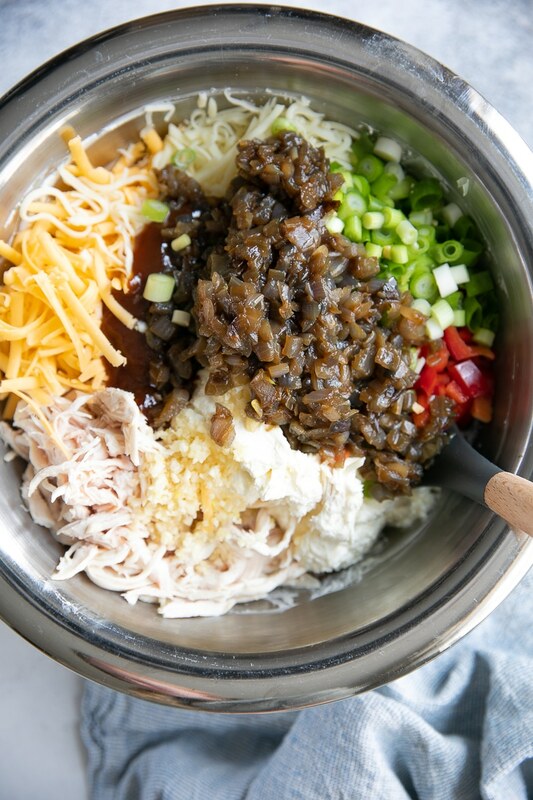 Grab a large mixing bowl and add all the ingredients (softened cream cheese, ranch dressing, BBQ sauce, garlic, red bell pepper, green onion, cheeses, corn, caramelized onions, AND, the chicken). Mix well to combine (this is where it will come in handy to have room-temperature cream cheese). Bake. Transfer the mixture to a large cast iron or oven-safe skillet (or baking dish). 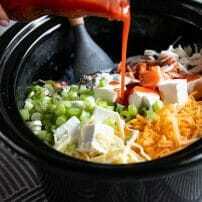 Drizzle the top with additional BBQ sauce and sprinkle with a mixture of cheddar and mozzarella cheese. 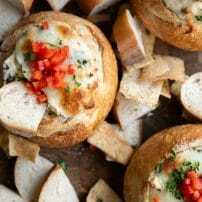 Bake for approximately 20-25 minutes, or until the mixture is bubbly and cheese is golden and melted. Garnish and Serve. 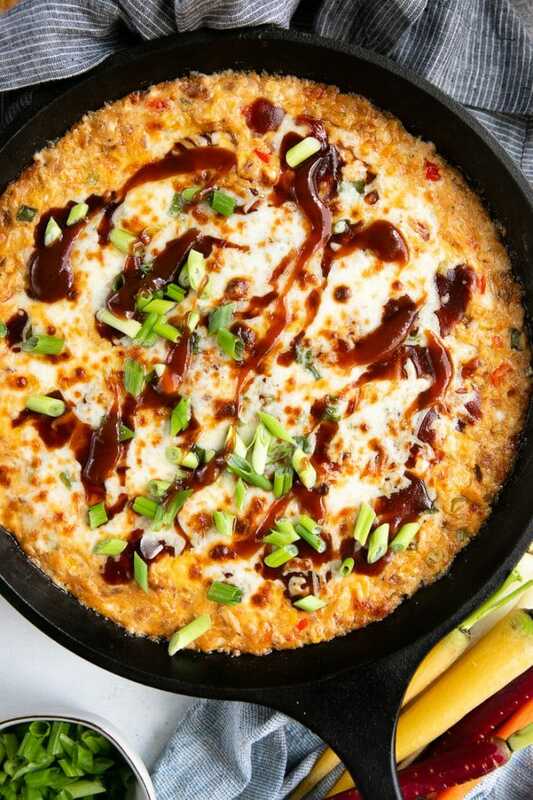 Drizzle with additional BBQ sauce and green onions. Can you prepare any of this ahead of time? Prepare the chicken and the caramelized onions ahead of time. These two steps are the most “hands-on” and time consuming, so feel free to prepare each of these the day before. Prepare everything ahead of time and bake later. 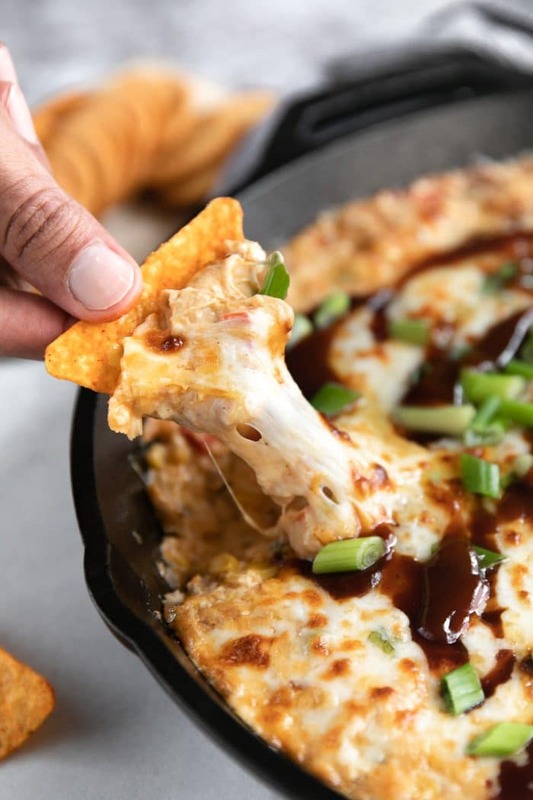 In other words, if you have a party the next day and you want to have your BBQ Chicken Dip ready to be popped in the oven for the next day, simply prepare everything, assemble, and refrigerate until ready to bake. The slow cooker. 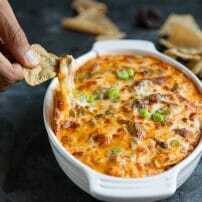 Yes, you can make this BBQ Chicken Dip in the Slow Cooker. However, you will need to prepare the chicken and the caramelized onions first. Once the chicken and the onions are cooked, simply add everything to your slow cooker and cook on HIGH for 1-2 hours or LOW for 2-3 hours (stirring occasionally). Sweet, tangy, and filled with gooey melted cheese, this BBQ Chicken Dip is fun and irresistible dip for any occasion! Poach your chicken. Bring a medium pot of water to a boil over high heat. Once boiling, add the chicken breasts so that they are fully submerged in the water. Return to a boil, cover, and remove from heat. Allow chicken to cook for approximately 20-30 minutes, or until internal temperature registers 165 degrees F. Carefully remove the chicken from the pot and, once cool enough to handle, shred using two forks. Preheat oven to 425 degrees F. and grab a large mixing bowl. Add all the ingredients (softened cream cheese, ranch dressing, BBQ sauce, garlic, red bell pepper, green onion, cheeses, corn, caramelized onions, AND, the chicken). Mix well to combine. Transfer the mixture to a large cast iron or oven-safe skillet (or baking dish). Drizzle the top with additional BBQ sauce and sprinkle with a mixture of cheddar and mozzarella cheese. Bake for approximately 20-25 minutes, or until mixture is bubbly and cheese is golden and melted. Drizzle with additional BBQ sauce, if desired, and serve with your favorite crackers and chips! Enjoy!